Sabi Sands & Kruger Park Safari: A Once-in-a-lifetime Experience! 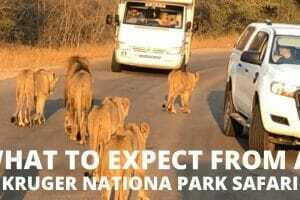 Doing a Kruger Park safari was never on my bucket list! But it turned out to be one of the greatest experiences of my life. Read about my extraordinary safaris at Sabi Sands and Kruger National Park and you will see why you must visit these places when you’re in South Africa. Lions, zebras, giraffes, rhinos, elephants, hyenas and many other animals that you may have never seen before. They are not in cages, a safari guidebook or an YouTube video. Instead, they’re roaming freely, sunbathing, eating, crossing roads, cuddling, hunting, playing and even fighting just in front of you. Some of them get so close that you feel like you could touch them. But you’re allowed “only” to observe and learn about their lives. 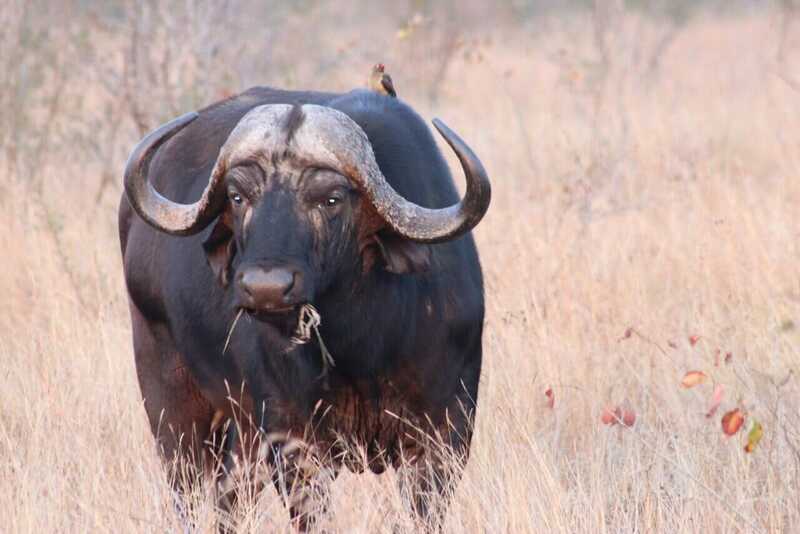 Are you ready for a Kruger Park safari? It’s going to be one of the greatest experiences of your life! 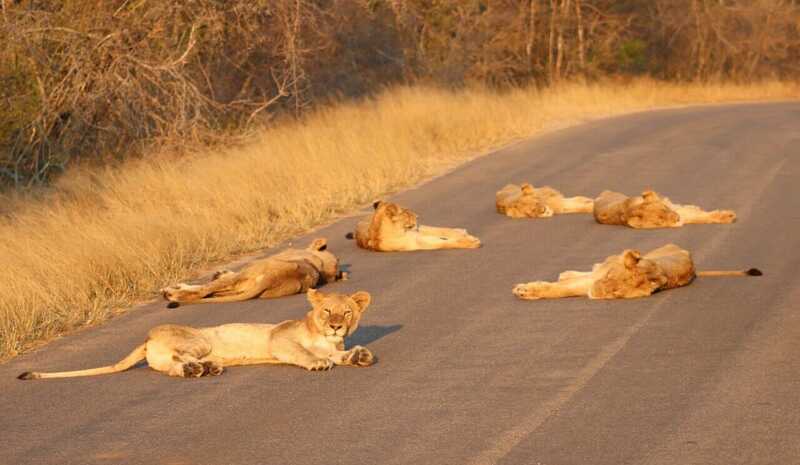 A Kruger Park safari is a once-in-a-lifetime experience! Sabi Sands and Kruger Park Safari: a once-in-a-lifetime experience! Where are Sabi Sands and Kruger National Park? After exploring the city of Cape Town and spending a weekend in Johannesburg, I headed to Mpumalanga, the province where I would go on safari for the first time in my life. I knew I wanted to do a Kruger Park safari, but there were so many Kruger National Park tours from Johannesburg that it confused me completely. 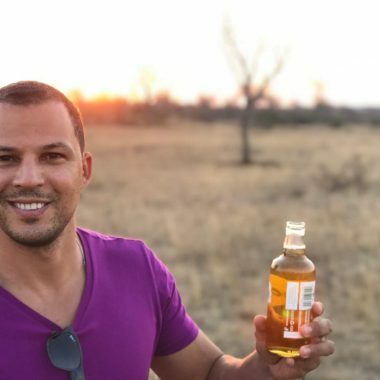 I spent a lot of time researching on the internet and asking advice from some South African friends, and in the end I opted for a 4-day / 3-night Sabi Sands and Kruger Park safari. Firstly, because it would give me different experiences (sunrise, afternoon, sunset and evening safaris and also a bush walk), secondly the price was reasonable. Transportation, meals and lodgings were included and, additional to Kruger, which is considered the best South African National Parks, I would also visit Sabi Sands, the most famous private game reserve. The beautiful Sabi Sands Game Reserve. 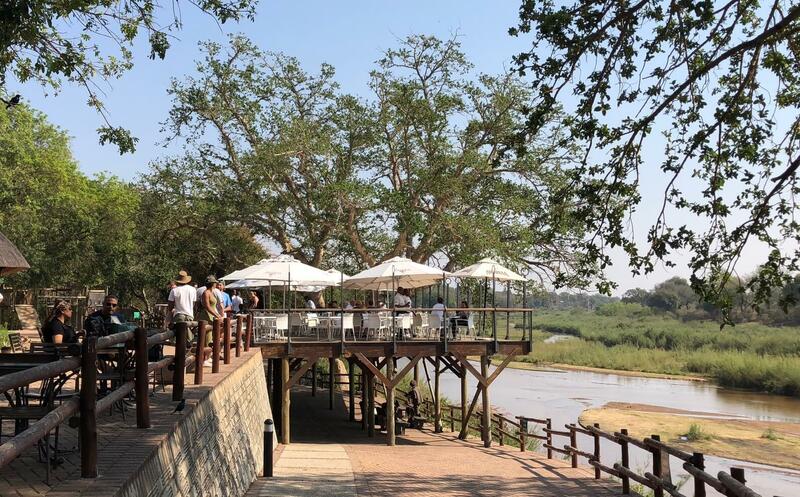 Sabi Sands is a 65,000-hectare private game reserve and a premier safari destination that shares an unfenced border with the world-renowned Kruger National Park. It was the first private nature reserve established in South Africa, proclaimed in 1898. Featuring a savannah landscape with watering holes, dry riverbeds, lowed woodlands, and the perennial Sabi and Sand rivers, Sabi Sand is home of the famous “Big Five” (elephant, rhino, lion, leopard and buffalo), a great variety of antelopes, zebras, giraffes and some of South African’s ultra luxurious safari lodges. 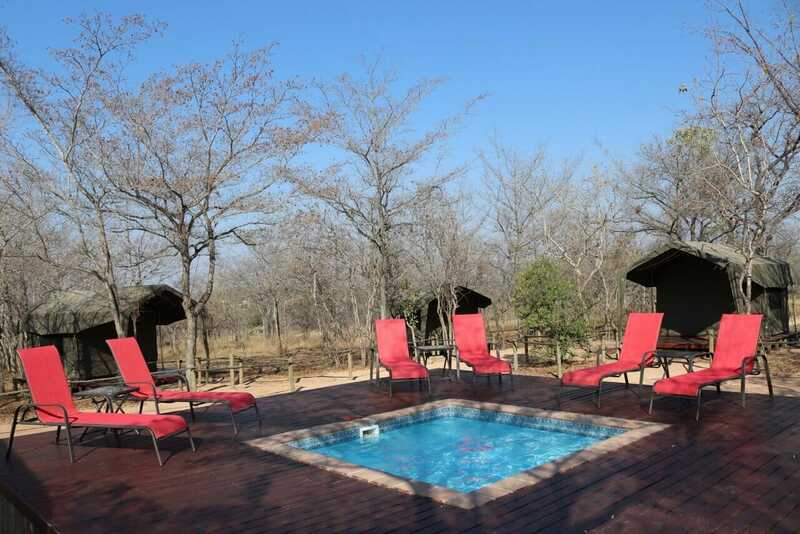 The advantages of staying in Sabi Sands are that only guests are allowed in the reserve, the lodges are very comfortable and the guides are highly trained and can drive off-road (something that is strictly prohibited in The Kruger National Park). 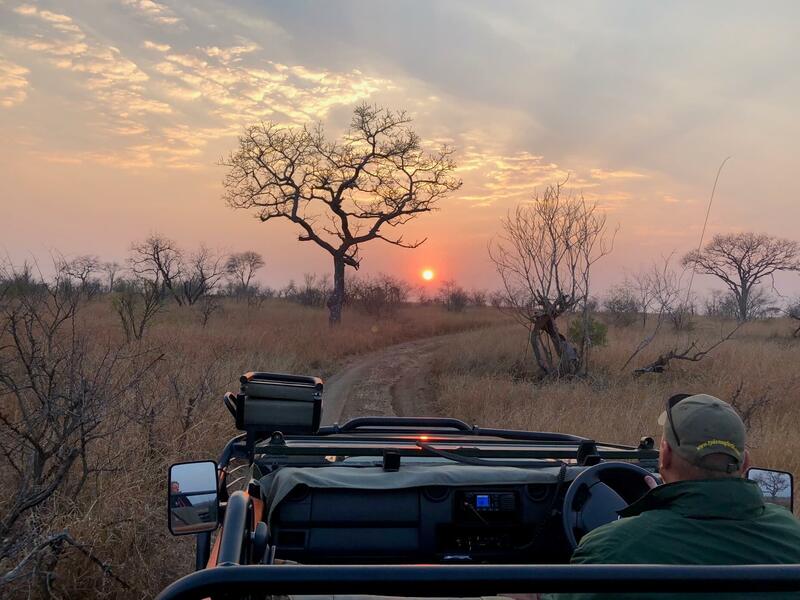 My 4-day / 3-night Sabi Sands and Kruger Park safari package included two game drives in Sabi Sands: a sunset/evening drive on the first day and a sunrise drive with a bush walk on the last day. 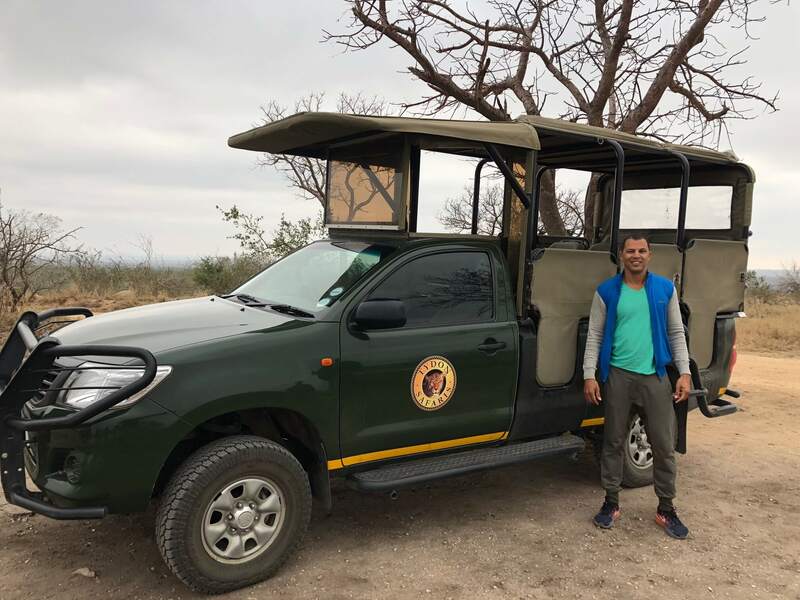 Around 3:30 PM the guide arrived at Tydon Eco Camp in a 4×4 roofless open-side safari vehicle with capacity for 9 people for my first game drive. I was very excited to be finally going on safari! 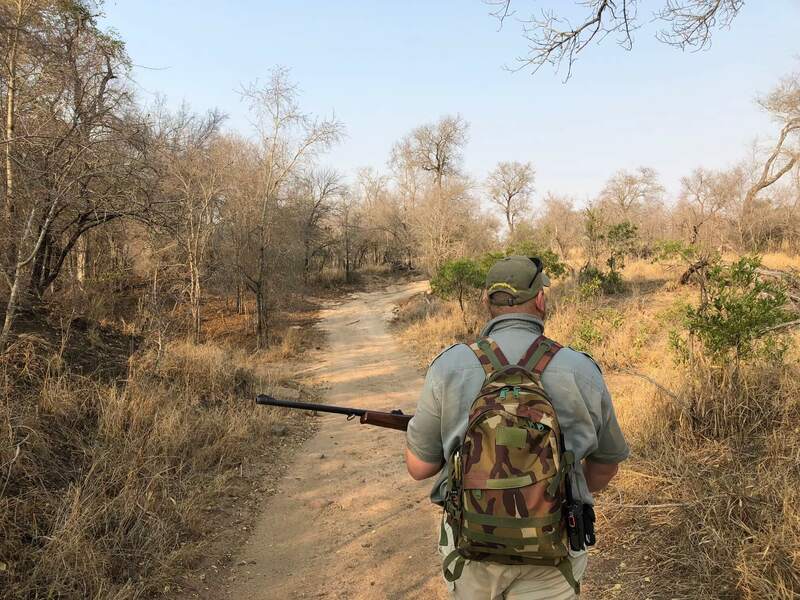 The best things about having a guide are that they are passionate about wildlife and can explain everything about it to you, they have the ability to spot animals, they know the park and are also able to talk on the radio to other guides to find out where the animals are. After few minutes we saw some zebras, impalas and for the first time, I saw a kudu. I didn’t even know that this animal existed before. The beautiful and huge antelope was resting, perfectly blending in with the vegetation. It took me a while to see it. I was truly amazed and learned the importance of spotting animals when you’re doing a safari. We saw more antelopes and when we found a giraffe, I realized the true advantage of driving off road. The guide not only got closer to the animal, but also parked the vehicle in a better position for pictures. As the sun was going down, we parked in an area to watch the sunset, eat some South African snacks and have sundowners. During the sunset is an opportunity to meet the make new friends and hear the guide’s stories. Billtong (a traditional South African snack made with dried meat), chips and nuts and a sider. After the sunset we continued our game drive, when the guide received a call on the radio to say that some people had spotted a leopard. He rushed and drove off road, passed through some small bushes and found the leopard close to a tree crawling very slowly. It was the first time in my life I saw a leopard and it was just a few meters from me. I was thrilled! But, as we couldn’t see the leopard’s prey, we eventually decided to move on in the twilight. 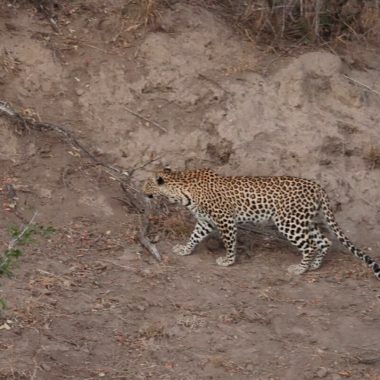 A leopard hunting at Sabi Sands. 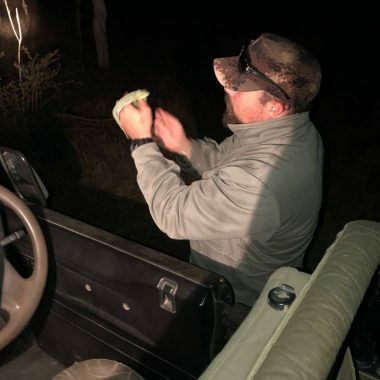 Can you imagine how difficult it’s to spot a chameleon at night? The second time I returned to Sabi Sands was for a bush walk. I was really looking forward for it! I could not miss another opportunity to be face to face with wild animals in their natural habitat. We arrived at Sabi Sands minutes before the sunrise. 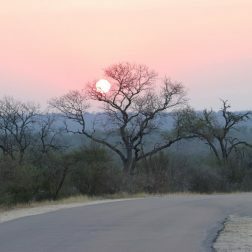 Seeing the sun rising in the bushveld was very picturesque! We arrived at Sabi Sands just on time to appreciate this wonderful sunrise! But despite our high expectation, the game view area was very quiet and we only saw a herd of buffalos, kudus and blue wildebeests. We parked the car and started walking in the bushes. I was a bit scared to be honest, but hoping to see some rhinos, elephants and even lions. Unfortunately the bush walk was even quieter. We only saw a few kudus and they ran away as soon as they heard our steps… I was so disappointed! However, I learned very interesting facts during the bush walk. I didn’t know that in the past pregnant South African women would make tea with elephant stool when they were not feeling well, nor that hyena excrement is white because of the bones they eat and that giraffes eat it to compensate for the lack of calcium in their diet. The guides carry a rifle during a bush walk but they rarely use it. I could write a post just about this experience. Explaining how guides use footprints to identify animals and also know when they were in that area and the direction they took, etc. A bush walk is an incredible experience and I really recommend doing it when you go on a safari! Even if you’ve never been to South Africa, you might have heard of the Kruger National Park. Kruger is one of the largest game reserves in Africa, situated in the provinces of Limpopo and Mpumalanga in northeastern South Africa. It covers an area of 19,633 Km² (7,580 miles²), extending 360 Km (220 mi) from north to south and 65 Km (40 mi) from east to west. The park has an immense botanic diversity with over 336 tree species and a great variety of animals that includes approximately 147 mammal species, 114 species of reptiles, 517 bird species, 219 butterfly species and 50 fish species. 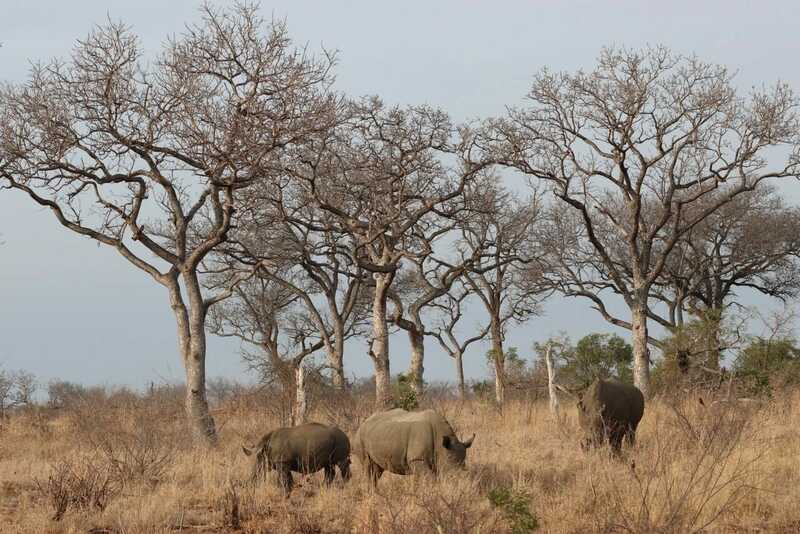 If you’re wondering about the possibility of seeing the “Big Five” during a Kruger Park safari, wonder no more. 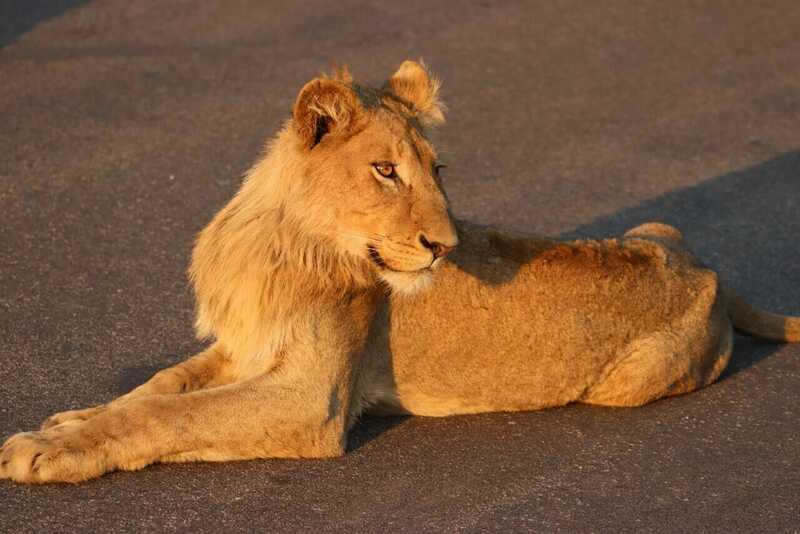 There is an estimated 1,500 lions, 17,000 elephants, 48,000 buffalos and 1,000 leopards in Kruger National Park. They are called Big Five not because they are the biggest animals on the African savanna, but because they are the most dangerous and difficult ones to hunt on foot. 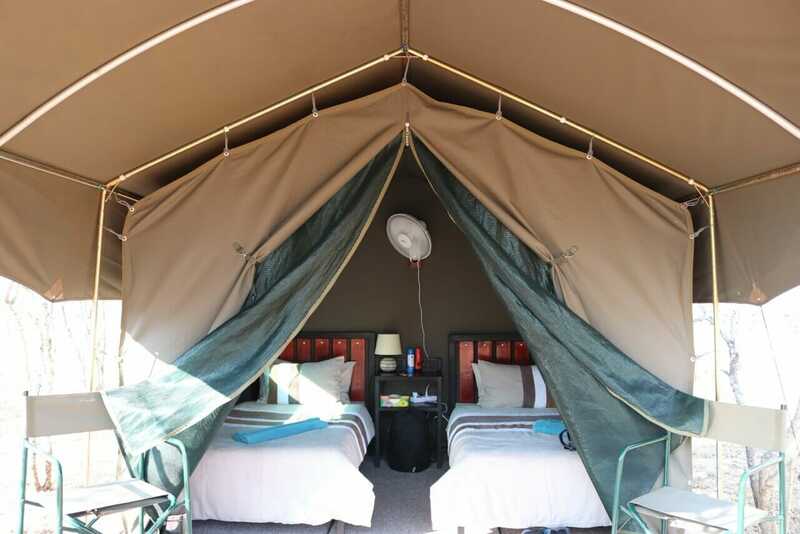 The park is open for day visitors, but if you prefer you can stay in one of the camping areas, safari tents, bungalows, cottage, guesthouses or luxury lodges inside the park. 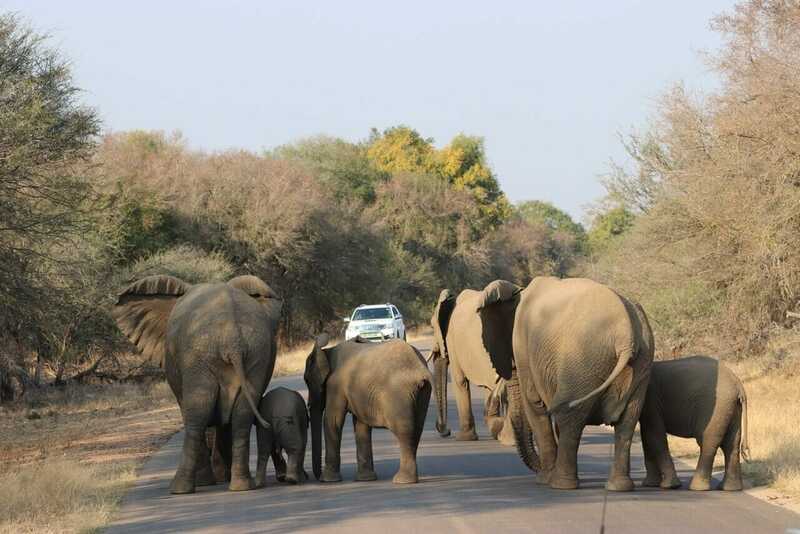 Kruger National Park is open daily, there are nine main gates and the entrance fee is R372 (US$ 27.30) per adult and R186 (US$ 13.60) per child per day. On my second day at Tydon Eco Camp I went to Kruger for an early morning safari. It’s my first Kruger Park safari and we started just before the sunrise. As soon as we entered through the Paul Kruger Gate we saw a hippo. The guide explained that is very rare to see a hippo outside of the water because of its sensitive skin. 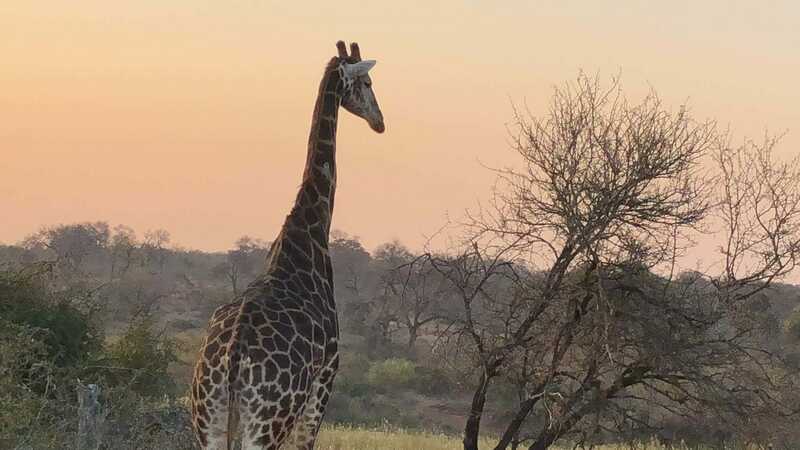 Then we saw many impalas, dozens of baboons playing in a tree, spotted hyenas running in the road, different eagle species, giraffes, mongooses, elephants, kudus and George, the hippo playing hide and seek in his “private pool”. 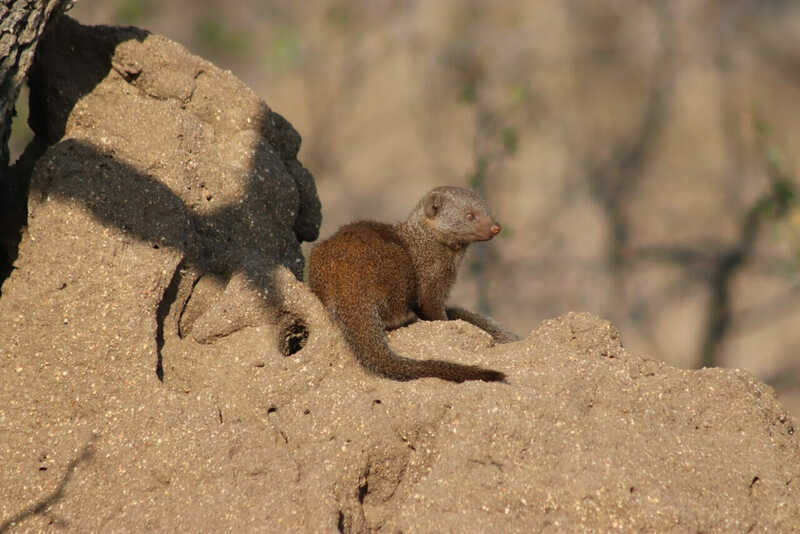 It was the first that I saw a mongoose. When we saw three rhinos, I thought they were black rhinos because of their skin color, but the guide explained that the difference isn’t perceptible on the skin color. The major difference is in the shape of their mouths (black rhinos developed a pointed lip while the white ones have a flat and wide lip). I was happy for seeing two of the “Big Five”, but a bit frustrated for not seeing any big cats. We had a break in one of the very few areas you can get out of the vehicle during a Kruger Park Safari and before going to back to the lodge we stopped at the Skukuza Rest Camp where there are some facilities, including a restaurant with a beautiful river view, bathrooms and a souvenir shop. A restaurant with a view at Skukuza Camp. The morning was good, but I didn’t know what to expect in the afternoon. 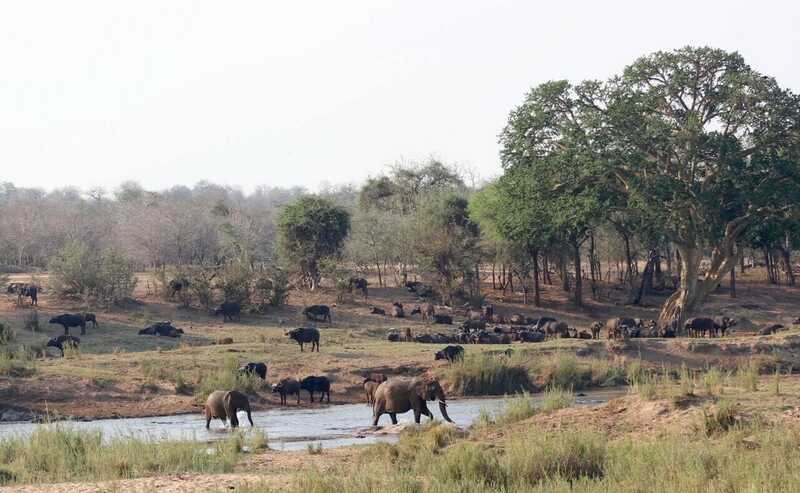 Because of the high temperatures, some animals go to waterholes to drink water while others, such as elephants and buffalos, go to the river to take a bath and cool down. Consequently, we saw many elephants and buffalos at the river and to our delight, a herd of elephants, including some babies, left the river and crossed the road just in front of our vehicle. Two of the Big Five at once. We saw some crocodiles, more giraffes, kudus, and I also spotted a leopard. Instantly, I screamed and asked the guide to stop the vehicle. I couldn’t believe that I spotted the feline behind the bushes staring at an impala. The poor antelope made some noise to let the leopard know that he was in her sight as well. 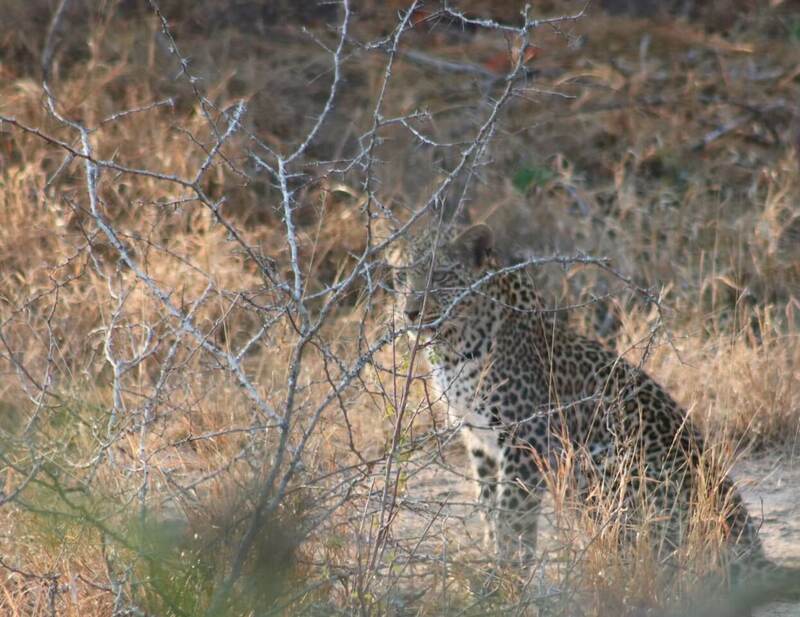 The guide explained that the leopard might not attack the impala, because it prefers springing a surprise attack. Suddenly the road was full of cars with people trying to see the leopard. I was so pride of myself and happy for spotting this leopard. Yet the best was still to come. 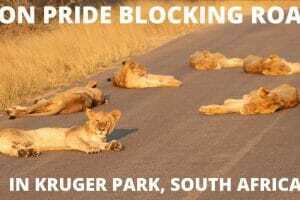 The guide received a phone call saying that some people saw a lion pride. He rushed to the place and when we got there 8 lions were lying in the road. OMG, I was completely in awe! They looked so cute and harmless that you want just to pet them. After some time they stood up and started walking. The big male that was sleeping exactly where we parked the car joined the group. We wanted to follow them but the guide decided to take another direction. I was extremely happy and pleased! That was certainly the best day of my Kruger Park safari and one of the most unforgettable moments of my trip to Africa. Before we left the park we saw some monkeys cuddling and playing in the road, an endangered bird specie, a rhino, a lioness with two cubs and the sunset. Yes, we saw the Big Five. What a big day! A beautiful sunset to finish the day! They are always so funny, aren’t they? 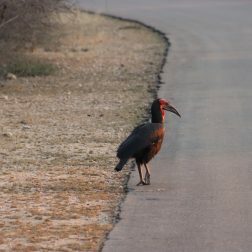 An endangered southern ground hornbill crossing the road at Kruger National Park. After that fantastic and unparalleled day, I wasn’t expecting that much from the second one. I really just wanted to see more big cats. And as soon as soon we started our Kruger Park safari, we heard a buzz about a leopard sleeping in a tree. When we arrived, the road was congested, as it is every time someone spots an animal. 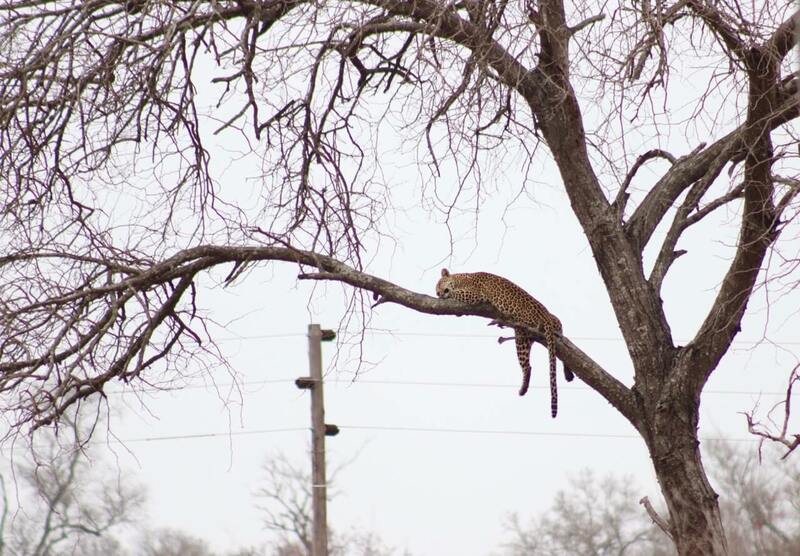 The leopard was sleeping undisturbed in a tree with his full belly. We saw more hyenas, kudus, zebras, giraffes, eagles, vultures and many other animals. Yet the best part of the second day was in the afternoon when we saw many elephants crossing at different times. On one occasion, there was a very young calf that was still learning how to walk. It was so interesting to see how elephants are so smart and protective! I left the Kruger Park extremely happy for being fortunate enough to encounter all those animals and learn more about the wildlife. 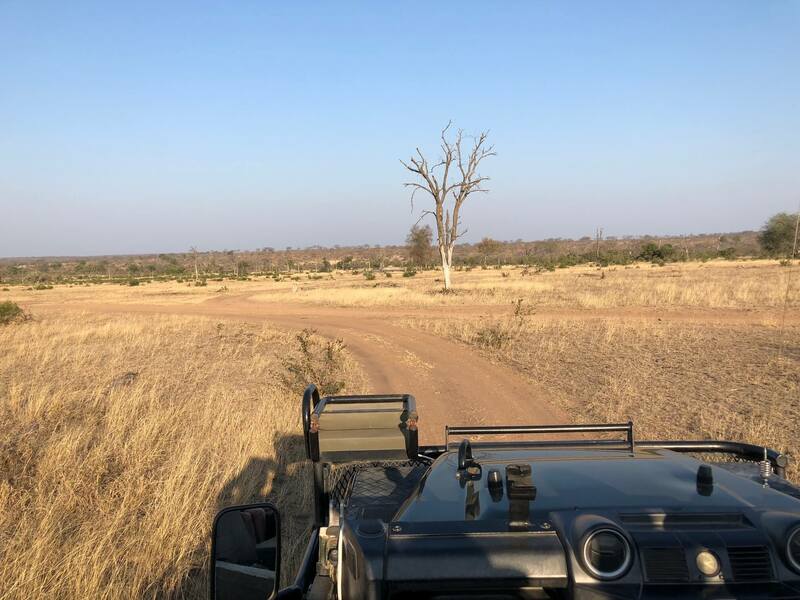 I still had one more night at Tydon Eco Camp, a bush walk the following day and other places to visit in South Africa, but I knew that nothing would beat my Kruger Park Safari experience. One of my main concerns before booking my safaris was the accommodation. Sabi Sands is known for having some of the most luxurious safari lodges, but I didn’t know that they also have a budget option. In fact, Tydon Eco Camp is a brand new tented safari camp just outside of Kruger National Park along the border of Sabi Sands Game Reserve. Even though I wasn’t staying in a glamorous bush lodge, I knew that Sabi Sands’ usual high quality would be present in the accommodation, food and service. I wasn’t wrong! I stayed in one of the seven traditional safari-style tents that are tucked away on raised wooden decks amongst the indigenous vegetation. There are private bathrooms, a swimming pool and an open-air boma for dining. In the carpeted tent there are two twin beds, side table with lampshade, plug points and a fan, a balcony with two chairs and is protected by a mosquito net. The beds are extremely comfortable and I didn’t think it was that hot inside. My tent with two beds. Upon arrival we were received by a very friendly host, Leonard, who would sit and talk to us by the campfire. Leonard also took us for a walk around the camp, is very passionate about his job and is someone with whom you can have interesting chats. I had such a very interesting, yet heartbreaking, chat with Leonard about the Apartheid regime. The food served is certainly one of the highlights of Tydon Eco Camp. For breakfast there is a selection of fresh fruit, yoghurts, cereals, freshly baked muffins, fresh fruit juice and also a traditional cooked breakfast. 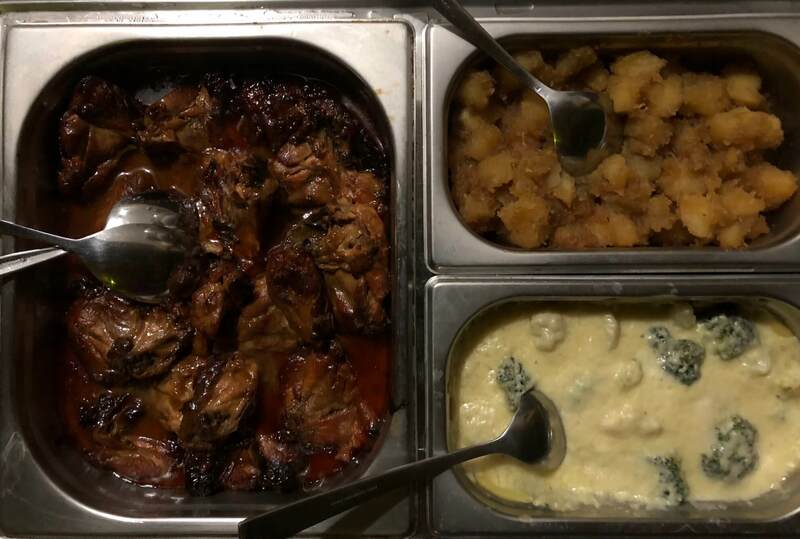 For dinner they serve traditional South African food, which is in general meat with a starch along with plenty of vegetables and a side salad. The dinner served on the first night was one of the best meals I had in South Africa. There are ice-cold beverages and South African wines for purchase and they also cater for vegetarians. The food served was so yummy!! I adored my stay at a Sabi Sand bush lodge, specially the high quality of the guides, Leonard’s hospitality, the food served and the comfy bed. Some people who visit South Africa decide not to visit Kruger and do a safari in one of the game reserves near Cape Town or at Addo Elephant Park when they travel along the Garden Route. 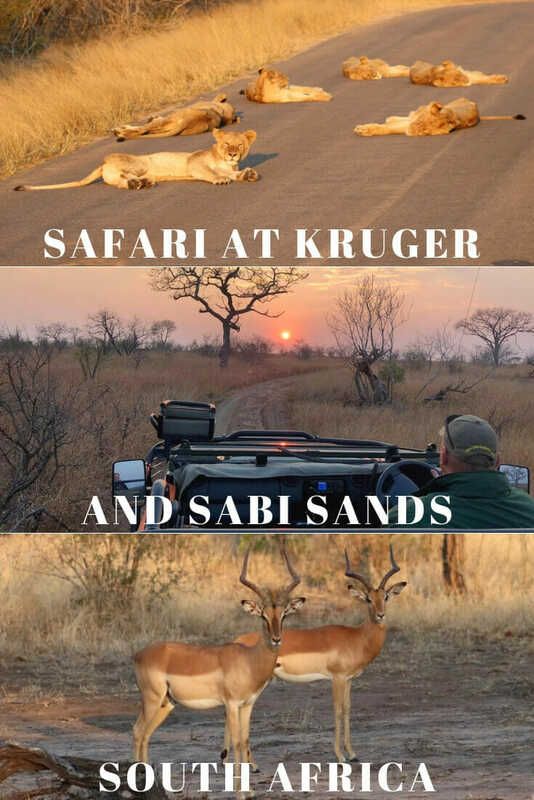 I did safari in three different South African National Parks and two private game reserves and I’m utterly convinced that Kruger offers the best South African safari. There isn’t shortage of animals in this park. You will see many impalas, kudus, zebras, giraffes, elephants and hyenas for sure. I really liked my stay at the Sabi Sand bush lodge and my safaris at Kruger National Park was one of the best experiences of my life. I got so immersed in this thrilling South African wildlife that when I left the park I was still seeing elephants on the roads instead of trucks and hyenas instead of dogs. 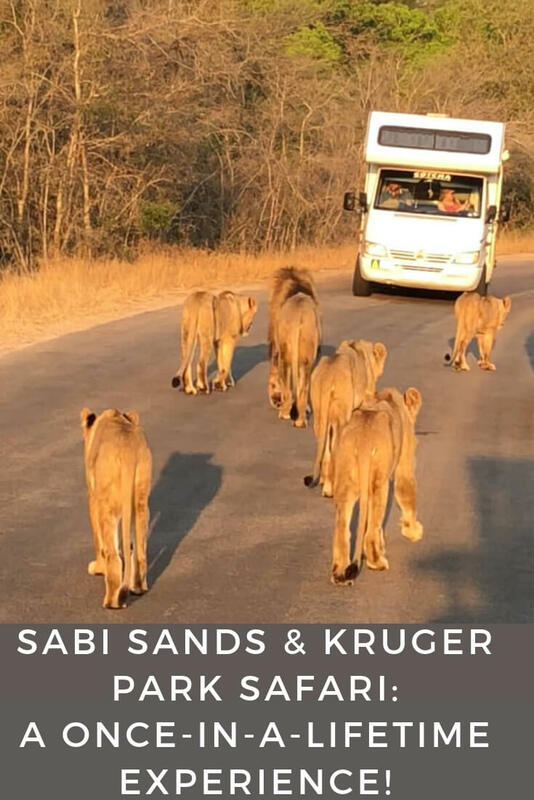 Sabi Sands and Kurger Park Safari are a once-in-a-lifetime experience and you should not miss it when visiting South Africa. Safe travels and have fun in your safaris. The safari vehicles are different in Kruger and Sabi Sands and it does make a difference in your safari experience. In Sabi Sands you feel closer to the animals because the car is fully open. There are tarred and gravel roads in Kruger while in Sabi Sands there are only gravel ones. 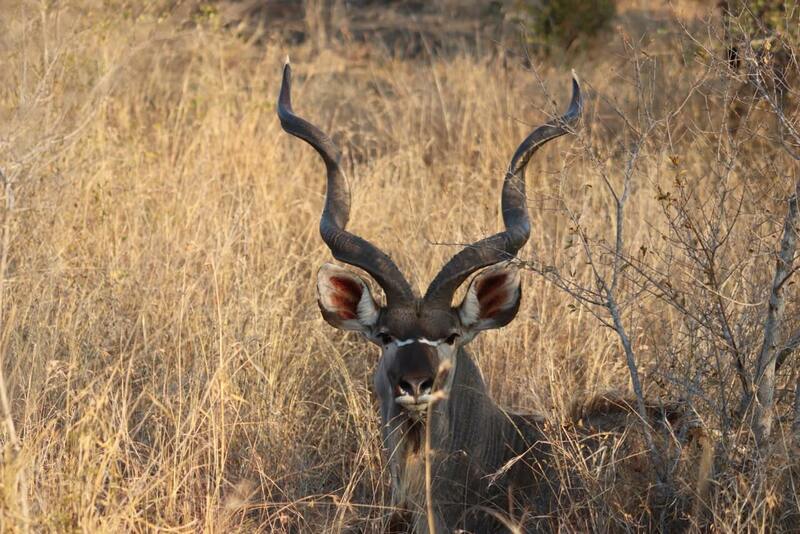 A nyala that passed through a fence and came towards me when I was at Skukuza Rest Camp. 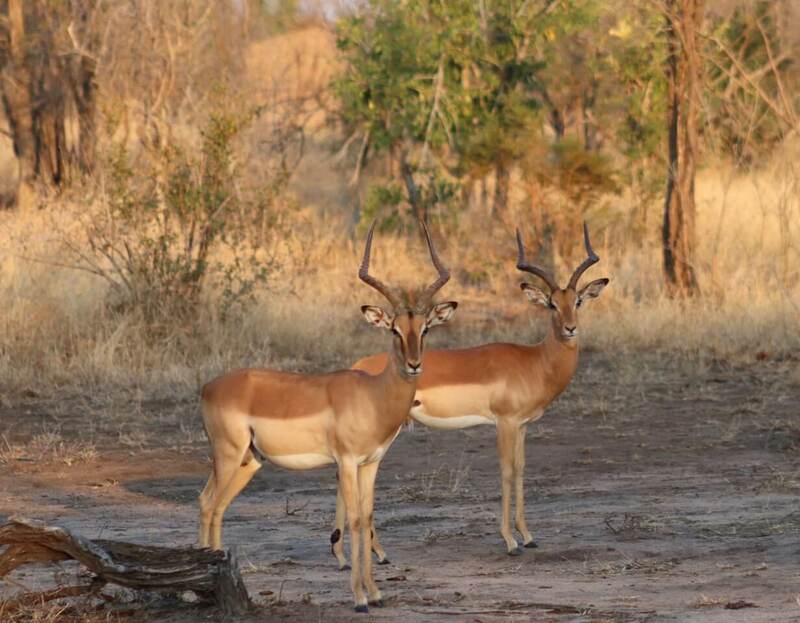 Impalas are known as the McDonald’s of the bushes: they are everywhere, run very fast and are eaten by many animals. Giraffes are called “The supermodels of the bushes” – they are tall, have long legs and huge eyelashes. 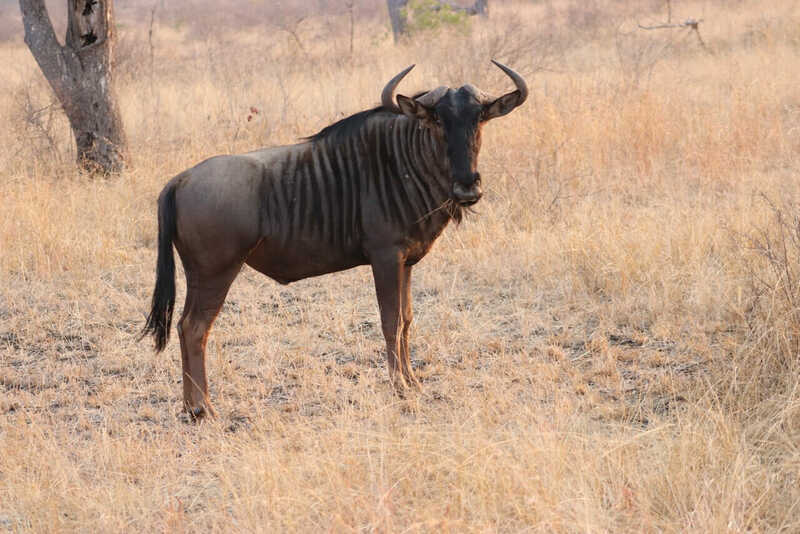 Blue wildebeests are known as the Frankenstein of the bushes: their back are similar to horses, they have stripes like zebras and the bull’s head. 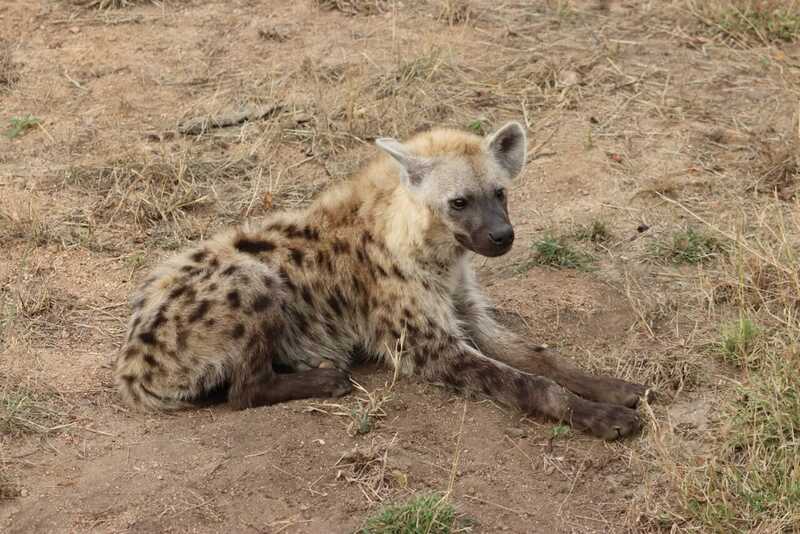 A spotted hyena resting. Hyenas have stronger jaws than lions. Kruger National Park lies in the north-east of South Africa, in the eastern parts of Limpopo and Mpumalanga provinces (check exactly location here). 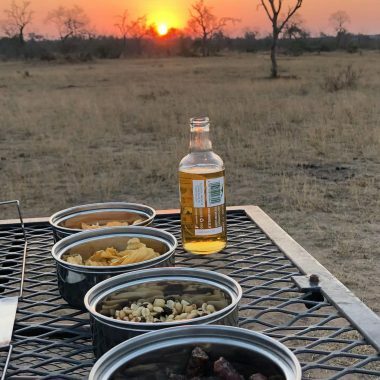 Sabi Sand is a private game reserve that flanks the south western section of the Kruger National Park (check the exactly location of the Tydon Eco Camp here). There are several ways to get to Kruger National Park ad each one has different costs and implications. Southern Kruger Park: Kruger Mpumalanga International Airport (KMI). There are daily flights from Johannesburg to the three airports and from Cape Town and Durban only to KMIA. The only airport located in Kruger National Park is Skukuza Airport (SZK) that is set within the bushes of Sabi Sand. Airlink, a subsidiary of South African Airways, is the only airline offering direct flights to and from Cape Town and Johannesburg is prices are quite expensive. You can book your flight here with Skyscanner, that is the website that I use, trust and recommend. 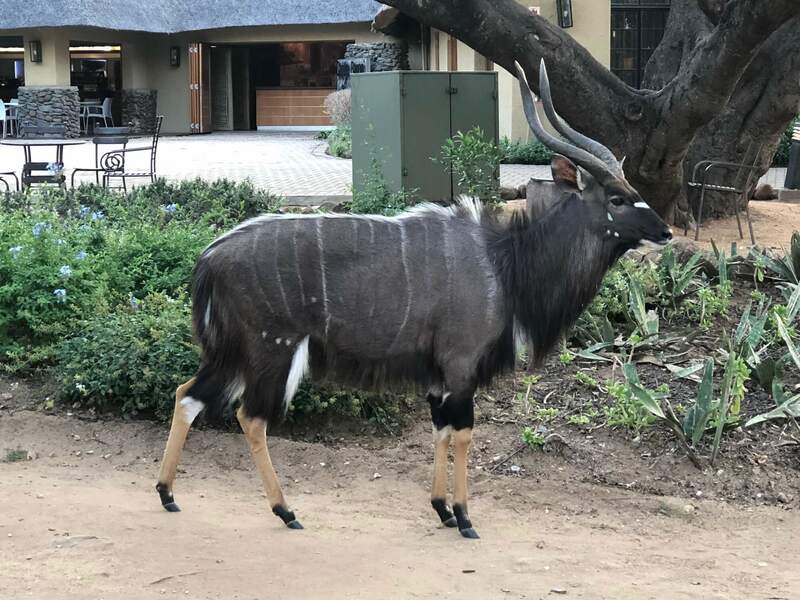 You can hire a car at either of these 3 airports near Kruger Park: Nelspruit, Hoedspruit, Phalaborwa and also at Protea Hotel Marriot Kruger Gate. There are scheduled shuttle services between Johannesburg airport & Greater Kruger with Ashtons and if this is a great option if you don’t want to drive and a transfer isn’t included in your tour. The best season for safari is the dry season (from May to September). During this time of the year there’s less vegetation and animals gather around rivers and waterholes, which makes wildlife easier to spot. There are also fewer mosquitos, the skies are clear and most days are sunny. 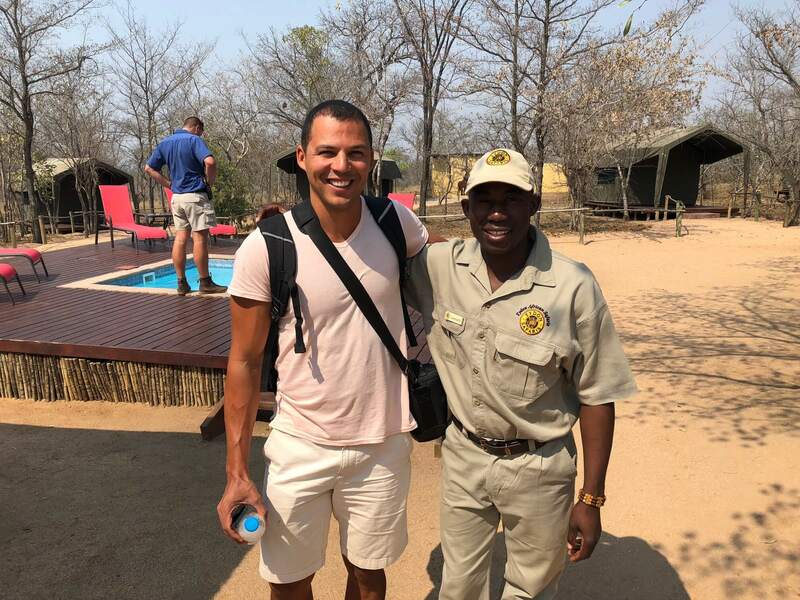 If you aren’t sure of what to wear on safari in Africa, below there’re some tips based on my experience and what people from Sabi Sands said to me. – Choose neutral tones and light fabrics, preferably cotton, because these fabrics work best in a hot climate. – Pack about 3 t-shirts and 3 pairs of shorts. Do not pack white shirts, red, which attracts animals (just in case you’re doing a bush walk), and if you are going into an area where Tsetse flies are present then you should also avoid the colours blue and black. – Pack a couple of long sleeved shirts and a pair of long trousers. During the winter also bring a jacket because it can get very chilly while you’re in an open vehicle. – A lightweight waterproof jacket is highly recommended during the summer. – Bring a good pair of trainers (hiking shoes for bush walk), hat, sunscreen, binoculars, sunglasses, books and a medical kit. Remember that the Kruger National Park is in a malarial area. – Safari isn’t cheap, but it’s totally worthwhile paying for it. 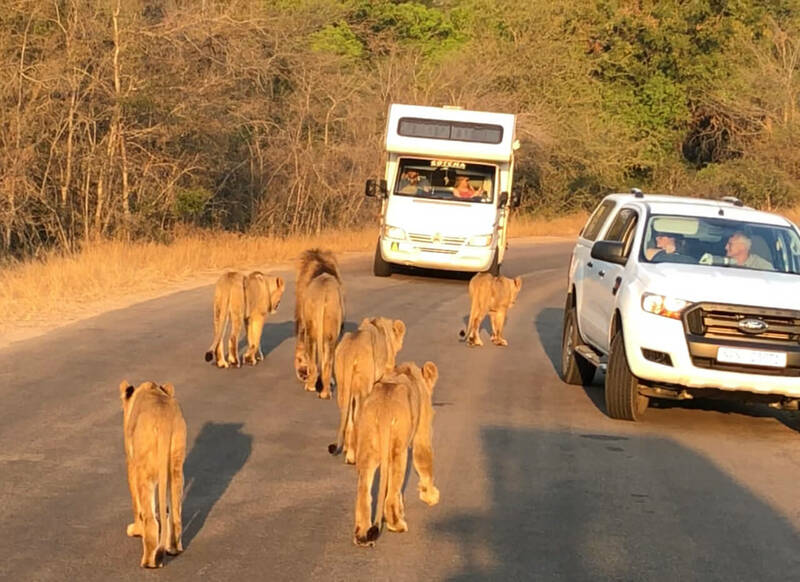 – If you decide to stay in one of the lodges in Kruger, I recommend booking a guided safari with a private company, because the vehicles offered by the park are big with capacity for over 16 people. – Self-drive vs guided safari? 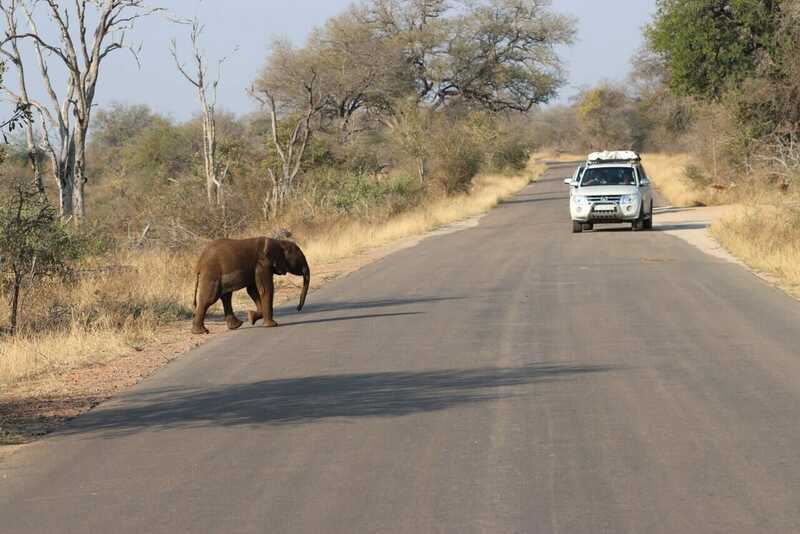 You can do a self-drive safari at Kruger Park, but I personally think that doing it with a guide is much better. They are in the park everyday and can identify the animals and explain everything about them to you. – Ask the company if they are offering two game drives on a day (sunrise and sunset), or if it’s a full-day safari. When you spend the whole day in the park you can cover more ground and see different areas and probably animals. – Bear in mind that nature is unpredictable. One day you can see many animals and on the other you may not find one of the “Big Five”. This is crazy!! Not sure what to say about this situation, but I believe that they wanted some money. You know, when you said that there were monkeys trying to get into your car, I assumed that the area you parked wasn’t safe / appropriate. I do think that they have cameras in the whole park and saw you breaking the regulations. Otherwise how would they know? Anyway, I’m glad that in the end everything worked out though. Apparently the stop with the monkeys was the one place that was a sanctioned bathroom! They had concessions and signs to not feed the monkeys. But of course we didn’t have to use the bathrooms there. It was only a few hours later after our beverages (!!!) that we had to go. So pulled over safely to do so.